"The Jewish heart is horrified at the sight of Torah scrolls in a terrible disgrace"
Jerusalem’s police on Tuesday morning launched an investigation into the severe desecration of a synagogue in the heart of the city. 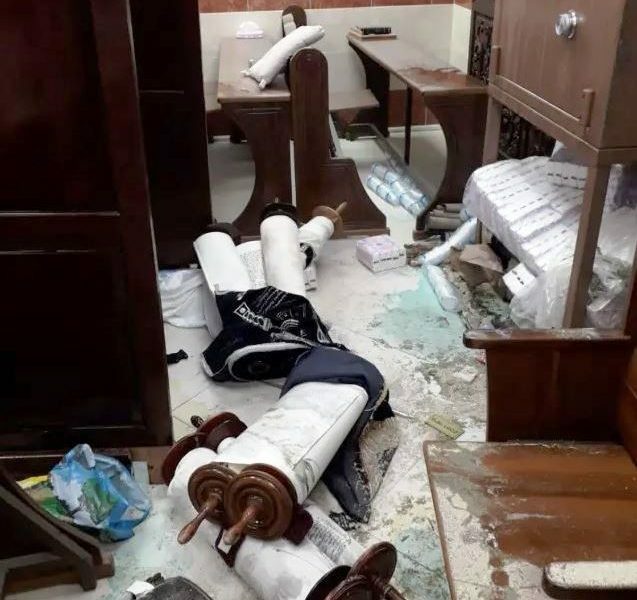 Vandals broke into the Siach Yisrael synagogue at the Kiryat Yovel neighborhood on Monday night and desecrated the Torah scrolls while pouring chemicals on them, broke the synagogue’s furniture and ransacked the sanctuary. Books were damaged or destroyed. The Otzmah Yehudith party called on the Shin Bet (Israel’s Security Agency) to investigate the incident. Kiryat Yovel has been the focal point of tensions between the non-religious and Ultra-Orthodox Jews, who have moved into the area in recent years. Non-religious residents have claimed that the Ultra-Orthodox are attempting to take over and change the neighborhood. There have been previous incidents of anti-religious action in the past, including another synagogue desecration and the damaging of the Eruv.